Berwick’s David Gold is looking forward to a trip to Edinburgh to play against his former club, Hibernian, in the quarter-finals of the Scottish Cup. The attacking midfielder joined Rangers after being released by the capital side and says he would love to get one over his former employers. 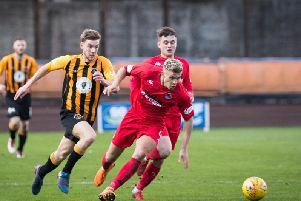 Gold was a product of the Hibernian youth policy, playing alongside Jordan Forster and Danny Handling, two former Berwick loanees, who are now starring with the championship outfit. “When I was growing up and playing for Hibernian I never thought I might be going to Easter Road to make my debut there as an opposition player. “I’m really looking forward to it, and I know my family will be as well - I’m sure they will all be there to cheer us on. “Hibs are on a good run of form at the moment but there is no reason why we can’t go there and put in a decent performance. “The win in the replay against Spartans wasn’t pretty. It was a scrappy game, but the result was the important thing.